Attempting to find out more about Rose Allatini, author of the extraordinary Despised and Rejected (1918), I’ve been looking at the autobiography of her husband Cyril Scott (1879-1970). He was a composer, and Bone of Contention (1969) is mostly about his music. It is a pleasant amble through his life, containing many anecdotes in which celebrities remark on how very good his compositions are. There is also a good deal about the occult, the other main interest in Scott’s life. He had been converted to theosophy by Madam Blavatsky, but had moved away from the theosophical mainstream into a more personalised esoteric philosophy. It is in connection with the occult that most of the book’s scanty details about his marriage are found. 1921 was a momentous year for me; it was in that year that I made my first conscious contact with Master K. H. and that I married the novelist, later to become better known under the name of Eunice Buckley. During my first interview with him, he told me that he had been using my brain for a number of years; in other words he had been telepathically impressing ideas upon me, both as regards my music and my books. It had been K. H., apparently, who without his knowing, had inspired his best-selling book The Initiate (by His Pupil). 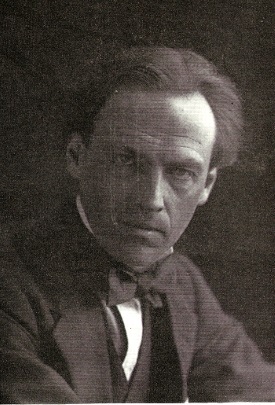 In 1921 K.H. changed Scott’s preconceived notions about marriage. He pointed out that it was not well for a man to live alone, for it was apt to foster selfishness and make him an introvert. Moreover, there was the literary work; Rose Allatini (her actual name) was or rather is not only a writer of considerable talent and ability but has a remarkable flair for literary criticism and could pounce on mistakes, oversights, solecisms and lapses of good taste with the eye of an eagle. Finally, there was some karma brought over from our last life together which had to be worked off between us, and if not adjusted in this present incarnation would have to be in the next – so why delay its liquidation? All this appealed to me as sound reasons for marrying Rose, who, likewise being a server of Master K. H., had already given her consent to his suggestion, albeit at some sacrifice to herself. Incidentally we both heard through him who we had been in our last life, though I am not prepared to divulge our names, Suffice it to say that neither of us was English, that Rose was an authoress and I a composer and had been one in my previous life. Between my last life and the present one I was only out of incarnation some thirty years, and Rose still less. The couple had two children, a girl and a boy. They drifted apart in the thirties (at about the time that Rose started to write novels again, under the name of ‘Lucian Wainwright’?). The family broke up for good on the outbreak of the Second World War. What to make of this kind of stuff? On the basis of the two novels of hers that I have read, Rose Allatini was a highly intelligent woman. Why should she be attracted to occult mysticism of this wild and woolly kind? Perhaps she just fell in love with Cyril Scott, occultism and all? Or perhaps this was a way of distancing herself from her family’s Judaism? Maybe. It struck me that the best thing for me to do was to make myself useful by playing at concerts in connection with war charities, of which there were a large number. So this book has not got me very much further in my quest to understand Rose Allatini. Despised and Rejected shows her sympathy for pacifism; Girl of Good Family makes one aware of her Jewish background; this book presents her as a dedicated sort-of-theosophist. How to make sense of such a mixture? This entry was written by George Simmers and posted on March 11, 2015 at 4:05 pm and filed under Music, novels with tags Cyril Scott, Rose Allatini. Bookmark the permalink. Follow any comments here with the RSS feed for this post. Post a comment or leave a trackback: Trackback URL.